Out of all 8, I have some favourites but it's a close call between the 4 bottom ones for a variety of different reasons. The Monki one with the pockets would be just perfect for work and the shape is beautiul. I love having pockets in my clothes too because pockets are practical and just the best. I also love the prints on the other three too but I can't decide if I like the bright floral print, the cards or the parrots best. They're all so different but all so lovely! I do really like the shirts on the top row too. You can't beat floral prints ever, and they go with soooo many colours. Can't lie, I'm pretty much loving all the Oasis shirts right now and I stumbled across GANT too which is where I found the car printed shirt and the shirt with the big jewels on the collar. I can imagine having a super monochrome outfit with the jewelled shirt. Or wearing a really lovely bright pair of trousers with it too. Block colours though to keep the attention on the jewelling. I really want to add some more shirts into my wardrobe. 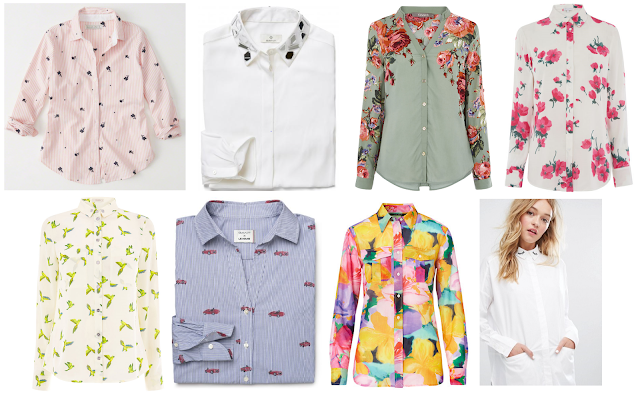 Send me links to some of your favourite shirts or brands that do lovely shirts too. Which one is your favourite from this week's wishlist?